(From left): Alex Preston, Brooke Dirvin, Raisa Gongora and Stefan Schneider, high school seniors from Darien, CT are working as interns at SoundWaters in Stamford, CT from May 15, 2017 to June 13, 2017. DARIEN — On a cool, foggy morning in June, middle schoolers from Trumbull put on waders and life vests on the shore of Cove Island in Stamford in preparation to delve into the cold water of Holly Pond to catch sea creatures with nets. Among the preteens were two Darien High School seniors, Alex Preston and Brooke Dirvin, putting on gear themselves and helping the students find life vests that fit. 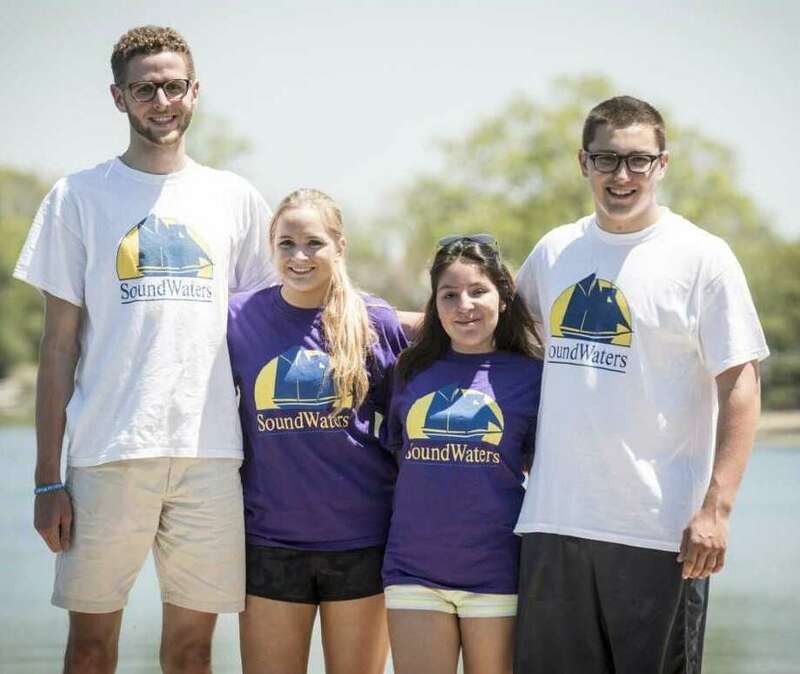 The two are part of a group of four Darien seniors spending their final weeks of school, from May 15 to June 13, working as interns for SoundWaters, a Stamford-based environmental education organization. For many of the students, their journey to SoundWaters began in their AP Environmental Science class. The interns help SoundWaters educators with programs teaching elementary and middle school students from over 65 local communities about the science and preservation of the Long Island Sound. These programs range from testing the pH of water when exposed to different elements to seining (fishing with nets) to catch shrimp and crabs to examine in the lab with the 100 to 200 children who visit the Cove Island center every day. The programs aim to teach young students about the Sound and how pollution affects the water and animals living there. But the students aren’t the only one learning. The interns themselves are able to learn more about science, dealing with children and what it takes to run a nonprofit. Leigh Shemitz, president of SoundWaters, said further educating the interns aligns with the company’s mission to protect the Long Island Sound through education. Having extra hands also helps, as the spring is the group’s busiest time of year. Not all of the intern’s work is glamorous. Some days, they’re schlepping in waders and others they’re licking envelopes to send out letters to donors. But the students have appreciated learning the intricacies of nonprofit work, education and marine biology. “You have to show interest yourself,” added Preston, 18, who said the experience has helped solidify his decision to study engineering at Pomona College in the fall. Intern Raisa Gongora, 17, said the work has helped her choose between studying environmental studies or writing at Pace University.